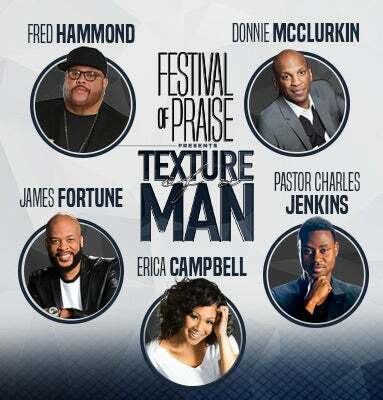 Award winning Gospel music artist Erica Campbell has been added to the ‘Festival of Praise Tour’ at Greensboro Coliseum on Friday, Apr. 6 at 7 p.m. The revised lineup for the star-studded tour features multiple Grammy, Stellar and BET Award winning artists including Campbell, Fred Hammond, Donnie McClurkin, James Fortune and Pastor Charles Jenkins. Tickets are on sale now at www.ticketmaster.com, charge-by-phone at 1-800-745-3000 and the Greensboro Coliseum box office. Fred Hammond - Grammy Award winning singer, songwriter, filmmaker, and multi-platinum producer has sold over 15 million albums worldwide, with over 12 No. 1 hits reaching both gold and platinum status. A Christian Music icon whose music reaches people from all walks of life. Chance the Rapper recently released a remake of Fred Hammond's song "Are You Ready" and Jamie Foxx sang his song "No Weapon" during his NAACP awards acceptance speech. He's worked with and admired by several well-known artists including Stevie Wonder, Snoop Dogg, 2017’s “The Voice” winner Chris Blue, "American Idol” Winners Reuben Studdard and Fantasia Barrino, Boyz II Men and Jodeci. Donnie McClurkin - Grammy, Stellar, BET, Dove, and NAACP award winner has had multiple No. 1 hits including his most popular single “Stand,” which went Gold almost immediately after being publicly lauded by Oprah Winfrey. The New York pastor has sold over 10 million albums worldwide and recently made history as the current host of “The Donnie McClurkin Show”--the No. 1 radio program in the entire New York radio market. James Fortune - inspired by Kirk Franklin, this songwriter, arranger, and vocalist has had numerous hits and has been nominated for multiple awards since his debut. While homeless with four children, he created and released his hit single which went on to become the No. 1 song in the country for 29 consecutive weeks. One of the most transparent and innovative artists of this generation, he fuses hip-hop with an uplifting message of hope, forgiveness, healing and grace. Erica Campbell - Erica Campbell has released two solo albums as well as 7 albums with her sister as part of the dynamic duo ‘Mary Mary’. Her album Help won a Grammy Award for Best Gospel Album as well as 8 Stellar Awards. She also hosts a nationally syndicated inspirational morning drive radio show, “Get Up! Mornings with Erica Campbell”. Pastor Charles Jenkins - coming on the scene in 2012, this artist’s breakthrough release “Best of Both Worlds” quickly snagged the No. 1 spot on Billboard’s Gospel Music Charts. Currently, Jenkins has the No. 2 single in the country “Grace” and critics are projecting he’ll be grabbing that familiar No. 1 spot again with the release of his sophomore project coming in March 2018.